Under the high ceilings of the Markel Center, a towering steel structure climbs toward the sky. Long-leafed plants flow throughout its frame and shea butter sculptures pepper the corners and edges of the pyramidal shape. On the floors below, eerie tones float from glass bodies, occasionally creating a random sense of harmony, which persists across the various mediums used by a group of international artists. The Institute for Contemporary Art at VCU simultaneously opened “Hedges, Edges, Dirt” and the first installment of its “Provocations” series, “Monument” Oct. 17. The exhibitions explore cultural history and modern issues, including immigration and urbanization. 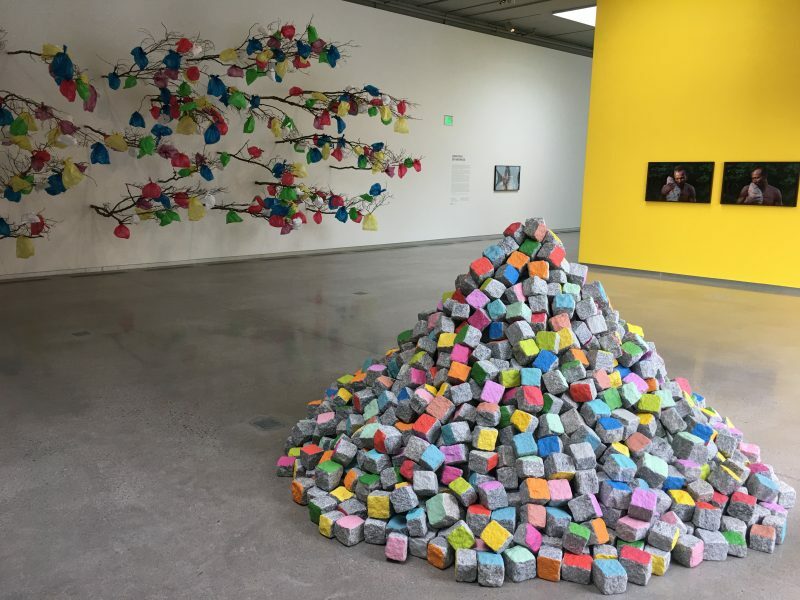 “Hedges, Edges, Dirt” is a collaborative exhibit, presenting work from Abbas Akhavan, Jonathas de Andrade, David Hartt, Julianne Swartz and Pascale Marthine Tayou. The exhibit is located on the first and second floors of the ICA’s Markel Center. On the first floor, a line of trimmed emerald green cedar trees welcomes visitors to the well-lit entryway of the expansive new exhibit. In the back room, tropical plants are overlaid in a rectangular shape centered on the concrete floor. The horticultural displays, “Untitled Garden” and “Study for a Curtain,” come from Akhavan, an Iranian artist based in Toronto. Richmond’s Lewis Ginter Botanical Garden provided Akhavan with many of the plants used in “Study for a Curtain.” Although none of the plants are native to Richmond, their roots in the city represent themes of global immigration and colonization. Photographs and stills from de Andrade — a Brazilian artist who captured the life of fishermen living on the São Francisco River — hang on the walls of the first floor. The 38-minute film titled “O Peixe” (The Fish) is accompanied by a series of seven photographs titled “O espirito das águas” (The Water Spirits 1-7). 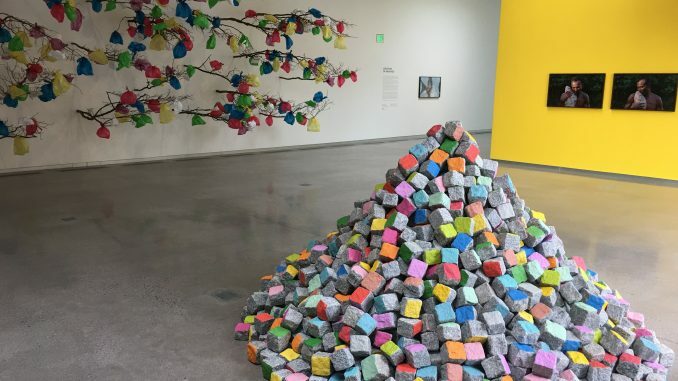 Between Akhavan’s greenery and de Andrade’s frames, branches decorated with colorful plastic bags sprout from the wall over a stacked arrangement of painted stones resting in the open space. These projects from Tayou present a comparison between the styles of Western society and the colorful markets of Africa, along with an observation on the ways global waste affects the world. On the second floor are the images and objects comprising Hartt’s series, “Negative Space.” It focuses on “The Last Poet,” a film made by Hartt featuring drone footage from cities along the East Coast, including a stop in Richmond. 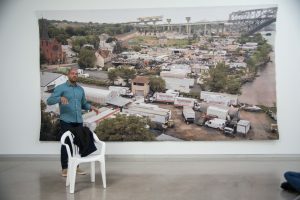 The series explores the appearances of modern urban spaces along with the decay of industrial society. This selection from “Hedges, Edges, Dirt” can best be represented by “Negative Space,” a large woven tapestry which displays an image of a modern, industrialized community through an otherwise antique medium. In the neighboring room, “Hedges, Edges, Dirt” continues with Swartz’s “Sine Body,” a gallery of glass and ceramic objects resting atop low platforms and high shelves. The art emits a unique acoustic sound, exploring the contrast between tangible and intangible materials in sculpture. In the third-floor exhibition space, the first installment of “Provocations” is on display with Rashid Johnson’s “Monument.” The structure is filled with plants, books and other artifacts — its metal arms are highlighted by white glow lights. “Hedges, Edges, Dirt” will be on display until Jan. 6 and “Monument” will remain at the ICA until July 7. Membership and general admission at the ICA is free. More information can be found at icavcu.org.